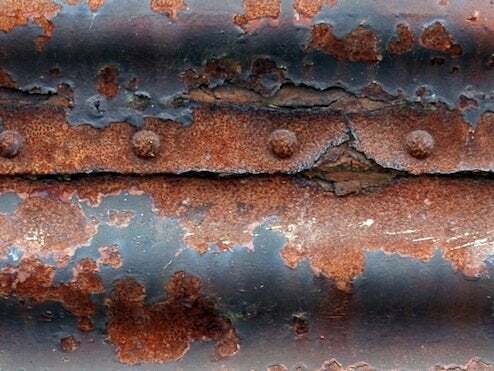 Reviving rusty metal tools or furniture is a great indoor winter project, and there are three ways to remove rust. You can grind the rust off using a power grinder fitted with a grinding wheel or disc, or a wire wheel to get into seams or around corners. Work your way up from a coarse grit to a fine 400-grit abrasive for a smooth finish. You can also use chemicals to soak the rust off, but it can take some time. Soaking doesn’t always leave a smooth finish, and unless you use one of the newer non-toxic, acid-free solutions, you’ll need a lot of ventilation. If you don’t mind that bumpy finish, the easiest way is to kill the rust is to brush off any flakes with a wire brush and then spray on a converter, which you can buy at any home center. No matter what method you use, always read the safety precautions, and prime before you re-paint.